Autopac Systems designs and manufactures in Australia, a wide range of X-ray inspection systems for use in the food industry, that automatically identify not only various types of contaminants but also missing or broken product, mass measurement (checkweighing), product shape confirmation, detecting packing voids and confirming fill levels. Inspection of the product is achieved by the computer controlled low energy generator, advanced sensor technology and a unique image processing system that makes the Autopac X-ray inspection system reliable at detecting minute product variations that signal contamination or deviation from the accepted specifications. X-ray systems provide improved levels of contaminant detection and operate on a different principle to metal detection, by measuring density rather than conductivity. X-rays can also identify a range of foreign bodies such as glass, plastic, rubber, bone and ceramics. As time passes, food retailers are demanding more from their suppliers, many are upgrading their guidelines, which all of their suppliers have to adhere to. If X-ray technology spans a wider range of contaminant detection, retailers will demand this technology from their suppliers as a simple due diligence decision. 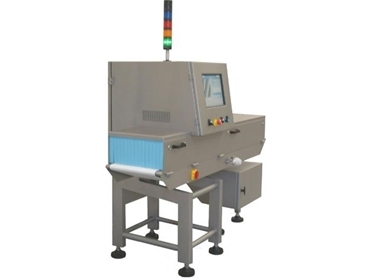 Contaminant detection: Metal, glass, some plastics, stone, calcified bone, some rubber, ceramics and other dense materials can be automatically identified and removed from food manufacturing lines. X-ray can identify metallic food contamination within metal packaging, glass contaminants within glass packaging as well as other foreign contaminants described earlier. X-ray image processing can identify the packaging and disregard it by only looking at the contents of the package. Missing product count: It has been an industry goal to ensure that the correct number of items is provided in a package of product. There are both legal and more importantly market-driven reasons why this is important. In many cases, this has proved to be impossible because the normal production weight of a good package would vary more than the value of a single item within the package. X-ray image processing software can identify/count products within a package to ensure it is correct. Product in seal: Finding product pinched in the seal has typically been nearly impossible, especially when the package is of printed film. Autopac X-ray technology can find small pieces of many types of pinched product within the seal of a package. Checkweighing: One distinct advantage of X-ray weighing known as mass measurement is the ability to independently weigh selected areas within a package. By weighing each area independently of each other, the effective sensitivity can be improved. An added benefit of the selective weighing is the ability to ignore the packaging in the measurement, increasing the systems performance. External interferences such as wind or vibration donot affect the weighing performance of an X-ray system. Ability to ignore metallic components to packaging: We are seeing without doubt the push for RFID devices on all packaging. The ideal time to inspect packaged food goods is at the finished/sealed stage by far, as there is little or no opportunity of foreign body contamination after this stage. RFID devices are basically small circuits implanted in the packaging of food items that automatically identify the product, when passed through a scanning device. The RFID device is a metallic circuit that would be detected by a metal detector in finished goods inspection. The image processing capabilities of the Autopac X-ray system can identify the RFID device / verify its presence without being deemed as a reject package. The system can also ignore metallic ties used in some sausage packaging, yet still inspect for metallic and other contaminants. User-Friendly operator control with 15” colour touch screen. The display provides a visual reference using real-time images and diagnostics data. Enhanced operational features include statistical display screen, image monitoring screen, operation manual, self diagnostics and troubleshooting functions. Easy-to-operate, with all product parameters and settings via Windows XP format. Set up is simple and operational parameters are stored for each product. Memory storage for over 50,000 reject images, that can be reviewed when system is operating. No frequent calibration required, as the system automatically analyses product variations, to continuously achieve optimum detection sensitivity throughout production. Higher speed – up to 4000 scans/sec = 175 m/min conveyor belt speed. Stainless steel construction, IP65 wash down construction. Network compatible – RS232C, Ethernet. External setup with system monitoring via modem or broadband. The system can be monitored on line by Autopac to assist operators with maintaining the systems performance. Autopac X-ray inspection systems can inspect virtually any discrete packaged items or continuous bulk flows that can travel by conveyor or that can be pumped through a pipe.